Be it in cinema or in real life, girls have always dreamt of showing off their tresses and adopting the latest hairstyles. Men, on the other hand, want improve their hair growth and retain a healthy shine. But not all of us are blessed with healthy hair and thanks to the stress, pollution and an improper diet, our hair becomes victim of split ends, breakage and dullness. The main source of our nutrition for both skin and hair comes from our diet, for we are what we eat. If we follow poor dietary habits, no topical application would give results whatsoever. So, it’s time we get into action and learn about vitamins for hair growth, strength and shine. Biotin is one of the most popular supplements for long and silky-smooth hair. Apart from nourishing your hair, it also breaks down glucose and proteins into amino acids. A form of B vitamin, it supports healthy skin, nerves, digestive system and the whole metabolism in general. Due to its high keratin content, it reduces hair loss and promotes nail growth. Dermatologists even recommend taking biotin with chromium picolinate to help with blood sugar levels. For everyday diet, snack up on peanuts, mushrooms, avocados, eggs, salmon and bananas. Vitamin B-complex is one of the most important nutrients needed for a healthy body. It promotes cell growth and division, which is needed for hair growth. Since the body can’t store vitamin B, it is easy to suffer from a deficiency. You can prevent or cure deficiency by consuming foods containing vitamins for hair growth such as meat, eggs, nuts, grains and vegetables or even take a daily supplement. Modern hair care products also contain vitamin B for topical care. 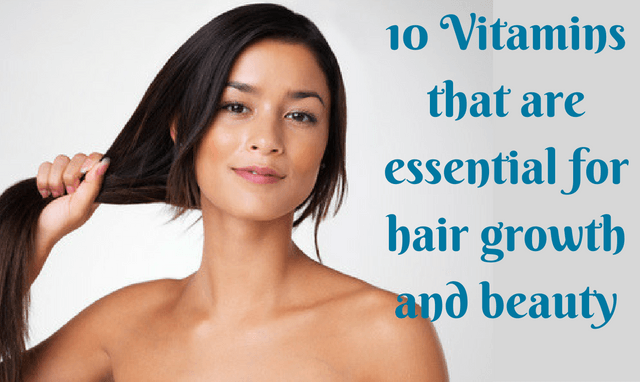 Vitamin E is an excellent source of hair growth vitamins, yet it is one of the most overlooked elements. Massaging the oil into the hair regularly reduces inflammation, increases blood circulation and repairing damaged hair. It also builds hair tissue and boosts oxygen supply, which promotes smooth and healthy locks. Though vitamin E is readily available in capsule form, it is better to consume nutrient-rich foods such as avocados, olive oil, wheatgerm, almonds, seeds and broccoli. It is also a good idea to use Vitamin E-rich haircare products. Though the skin and immunity benefits of vitamin C are very popular in the beauty world, it is equally important as a vitamin for hair growth. Vitamin C is an antioxidant that fights free radicals, which are responsible for weak and brittle hair. It also strengthens hair, cures dandruff and hair loss for thicker hair. For a more natural method, you can consume oranges, broccoli, Brussels sprouts, papayas, strawberries, bell peppers and kiwi. Another well-known member of the vitamin family, vitamin A helps in hair promotes of cell growth as well. It also helps in producing sebum which keeps the scalp from drying out and keeping hair soft and shiny. Apart from hair issues, vitamin A deficiency can cause vision and skin problems while its overdose can be detrimental to your hair growth solutions. Also known as ‘sunshine’ vitamin, vitamin D helps to promote healthy hair follicles which can be enjoyed by spending time outside in the sun and including fish, eggs, fortified milk, grains and mushroom into your diet. Overdose can lead to excess of calcium in your blood which can cause fatigue and kidney problems. Vitamins for skin are helpful in maintaining the skin’s elasticity, producing collagen, protecting the skin from ultraviolet rays and delaying the skin’s aging process. It is a good vitamin for hair growth and shine and prevents your scalp and strands from drying out. There is a recommended dose for supplements, and one should consult their doctor before intake. Otherwise, one can consume fatty acids by including salmon, sardines and mackerel. Vegetarians can have soya, walnuts, flaxseeds, canola and other oils. Though not a vitamin, the benefits of iron cannot be ignored when it comes to healthy hair. Such as it protects your nails from breaking, lack of iron makes your hair dry, dull, brittle and thin. To prevent further hair damage, get a blood test done to check for iron deficiency. Furthermore, follow an iron-rich diet such as lentils, soybeans, tofu, quinoa, fortified cereals, spinach, cashews and oysters. Hair is made up of keratin, which is a form of protein. Deficiency of protein can therefore lead to lack of food to your hair follicles, making them weak and brittle. There are a large number of food sources which can be used to replenish your protein intake such as lentils, soybeans, quinoa, yoghurt and spinach along with eggs, fish and meat. The body cannot store protein, thus it has to be taken daily to increase the speed of hair growth. Zinc consumption can be a good vitamin for hair growth promoting healthy hair by balancing hormones and eliminating dandruff. On the other hand, zinc deficiency can lead to thin hair and hair along with a weak immune system, poor digestion and irregular hormones. To replenish zinc in your diet, go for preparations made with spinach, chickpeas, pumpkin seeds, mushrooms, yoghurt, nuts, eggs, sweet potatoes and oysters. Though such a necessary requirement in our diet, people are mostly ignorant about the benefits of magnesium. Lack of magnesium could be the cause of heart attacks, diabetes, constipation, anxiety, depression and fatigue all of which can be countered by a healthy diet. On the other hand, magnesium reduces hair loss and promotes strong and healthy hair. It is also a good vitamin for the skin in reducing oiliness, acne and rosacea. To reap the benefits, have lots of leafy greens, beans, nuts, seeds, whole grains, avocados, yoghurt, bananas and salmon. Thus, if you’re looking for hair growth vitamins and solutions to thick, strong and healthy hair, you should check your plate before going for supplements and oils. However, if a proper diet and haircare doesn’t solve your hair woes, you can always visit a doctor for a check-up. Some good information about hair growth. You don’t think about your needs of vitamins and supplements to enhance your hair growth. When my hair started thinning, nothing worked until I started supplementing with zinc and selenoprecise selenium. Some of the above mentioned supplements were great for shine and overall health, but it was the selenium and zinc that made my hair fill back in. Stopping hair loss really does require quite a number of vitamins. Daily vitamin intake is essential in keeping yourself healthy. Also, remember to live a happy life away from too much stress because is the root cause of all sickness. Be positive and keep your hair thick. Indeed, not only do these vitamins are good for your hair but with balanced intake could also affect your overall health leaving you with healthier self.